The National Technical University of Athens (NTUA) examined the foundation of the temple in Jerusalem as part of a $4 million restoration project. The church is built atop the rubble of several destroyed previous versions of the building. A network of tunnels and channels lie beneath it, further destabilizing it. “When it fails, the failure will not be a slow process, but catastrophic,” NTUA’s chief scientific supervisor Antonia Moropoulou told National Geographic. Restoring the church has been discussed for decades, but the church’s custodians come from three different Christian denominations: Greek Orthodox, Roman Catholic and Armenian Apostolic. Rivalries between the branches have continually delayed the renovations. But after Israeli police briefly closed the building in 2015 because it was deemed unsafe, there was no choice but to begin the restoration in 2016. The church has been undergoing restoration since June 2016, but cameras and radar have revealed extensive stability problems. NTUA claims that another restoration project to grout rotting mortar and drain sewage and rainwater is required – a project with an estimated $6.5 million price tag. Archaeologists believe that in Jesus’s lifetime, the church was a defunct limestone quarry that served as a mausoleum for wealthy Jews in Jerusalem. The Roman emperor Hadrian built a temple to the goddess Aphrodite over the tombs around 100 AD. Two centuries later, Rome’s first Christian Emperor Constantine demolished the temple and replaced it with a church. The Sassanid Empire of Persia damaged the temple during a seventh century war with the Byzantine Empire. It was then entirely destroyed by the Fatimid Caliphate in 1009, but was rebuilt a few decades later. In the present day, the church is one of the most holy sites in Christianity and sees 4 million pilgrims every year. In particular, they come to see the the edicule (from the Latin aedicula, for “little chapel,”) the room in the church where Christ is believed to have been interred. Of course, since Christian dogma holds that Jesus rose from the dead three days after his death, it is virtually impossible to confirm whether any of the sites deemed to be his resting places was the real site of his interment. 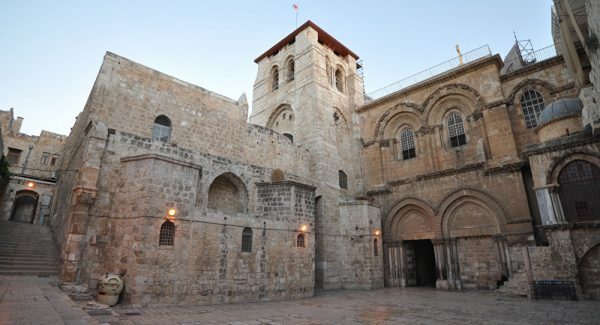 The Church of the Holy Sepulchre is one of five purported tombs of Christ. Two others are in Jerusalem while one is in Pakistan and a fifth, bizarrely enough, is in Northern Japan.